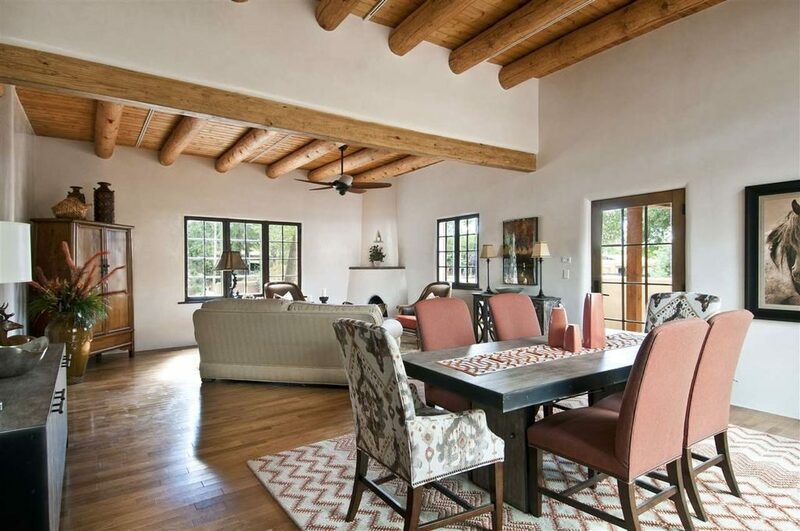 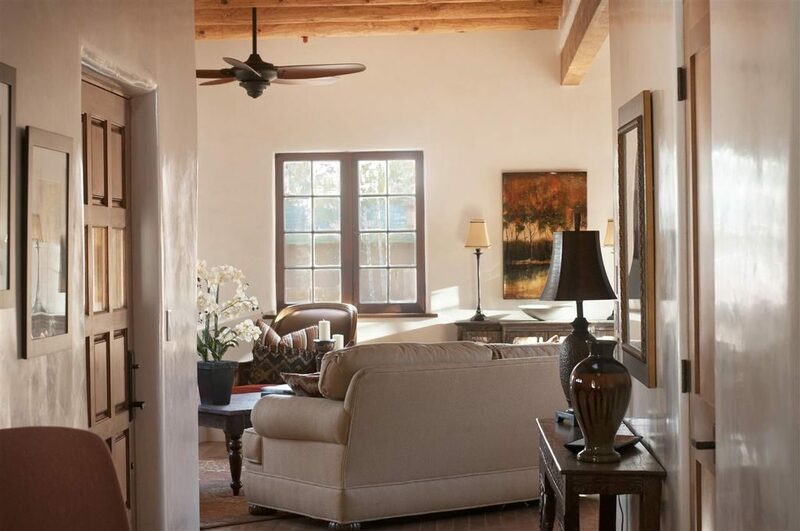 One of the things we like about this 2,300 square foot pueblo style home in Santa Fe, New Mexico is that the open spaces and mellow colors help make it feel larger than it is. 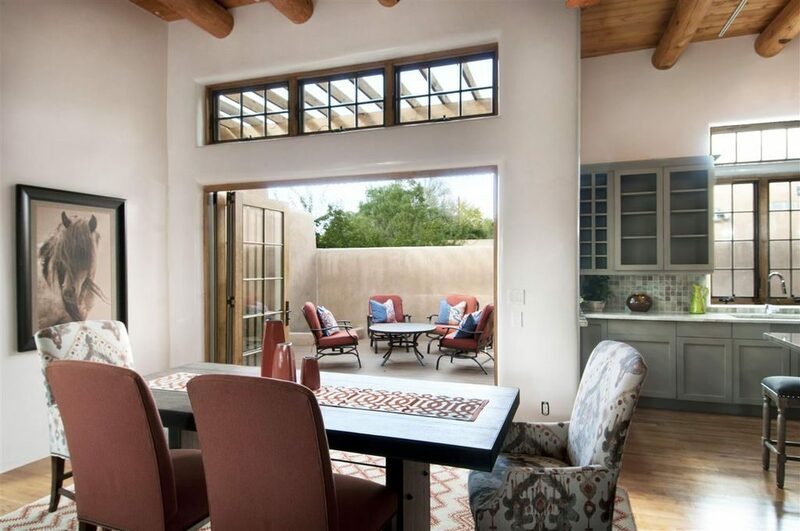 Or maybe it’s the high ceilings, tons of windows, and spacious outdoor living areas? 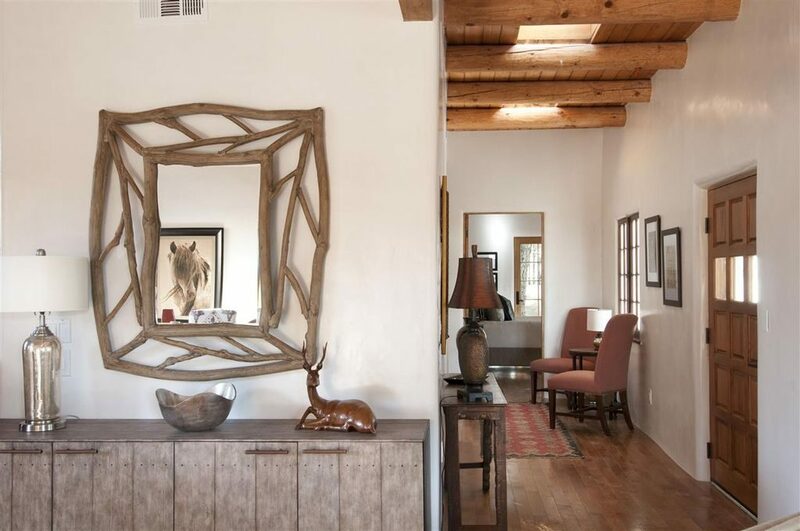 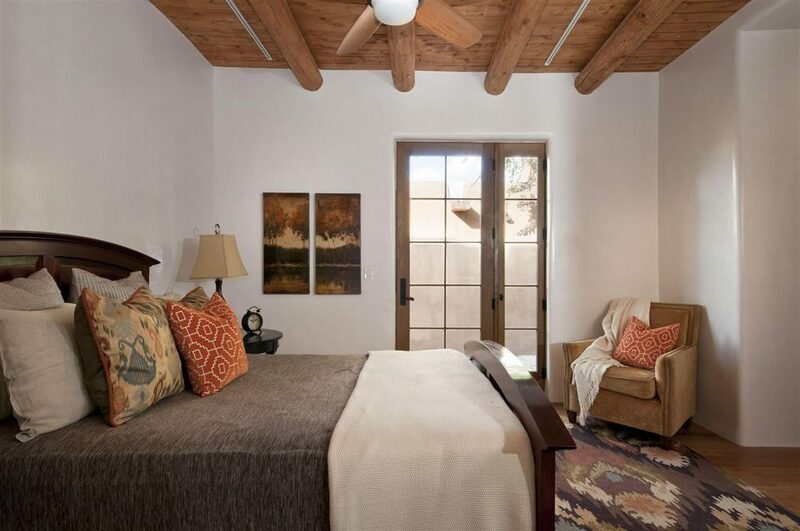 We like the softness of pueblo architecture – the rounded corners on the walls, the peeled-bark vigas on the ceilings, the rounded edges around the windows and doors (no trim anywhere, not even baseboards). 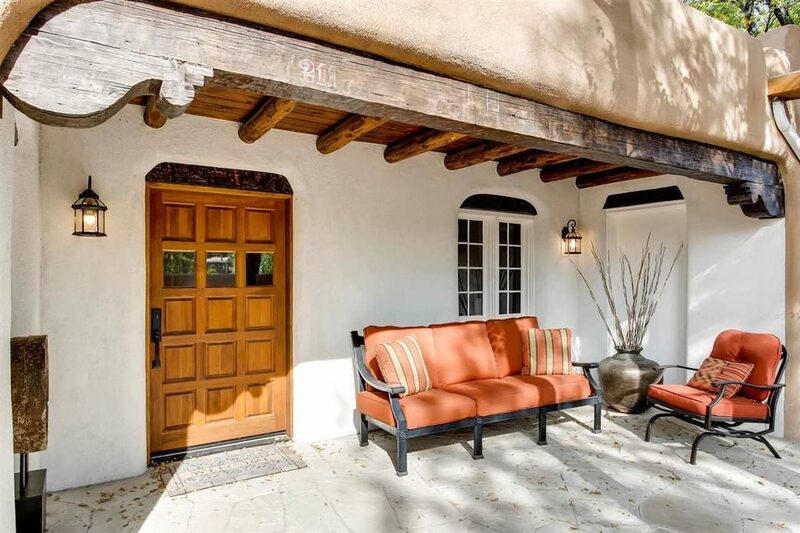 The Zillow listing said it’s just a short 5 minute walk to historic downtown Santa Fe – one of the most charming places in the western United States. 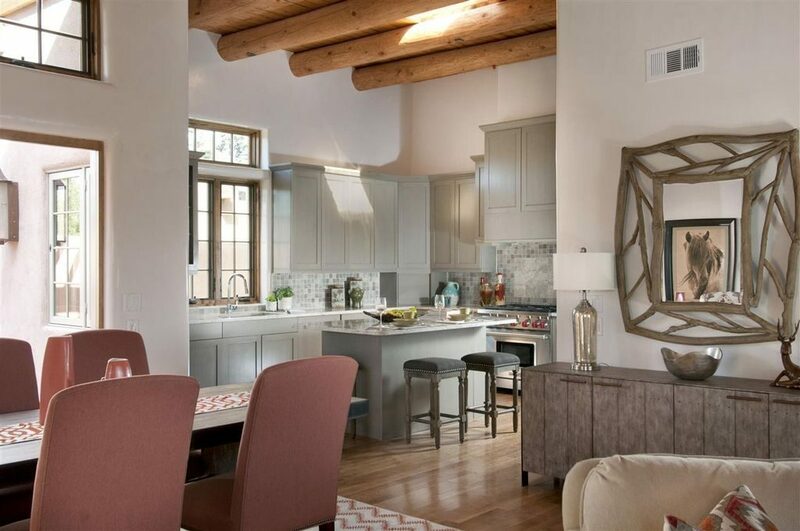 So obviously, the house is staged for resale (nothing in the cabinets!) 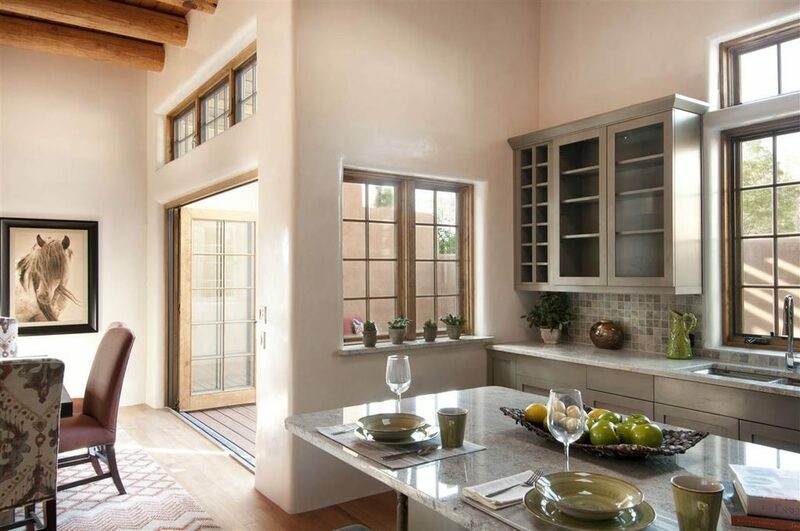 but just look at all the light pouring into the kitchen and dining area! 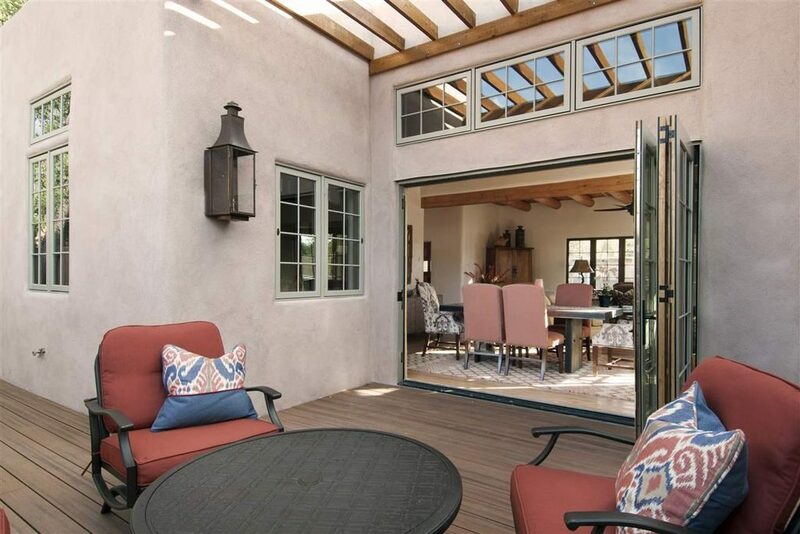 The entry courtyard – placita in the local lexicon – protects the front door. 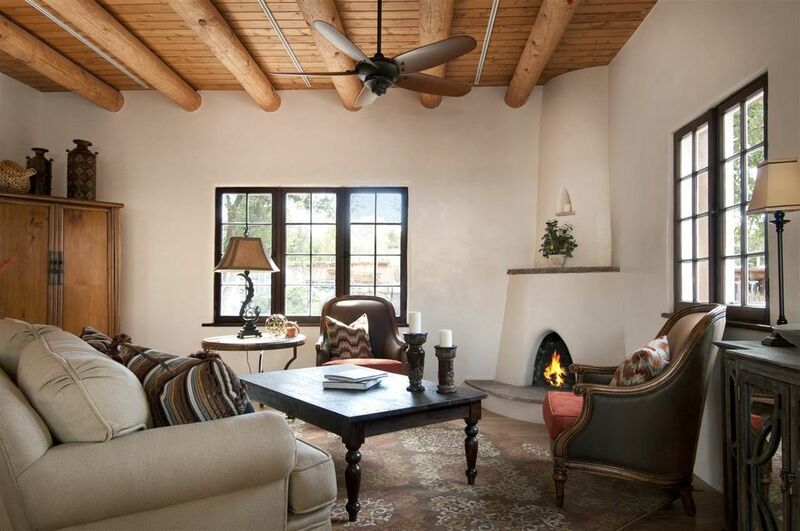 Love the white adobe inset! 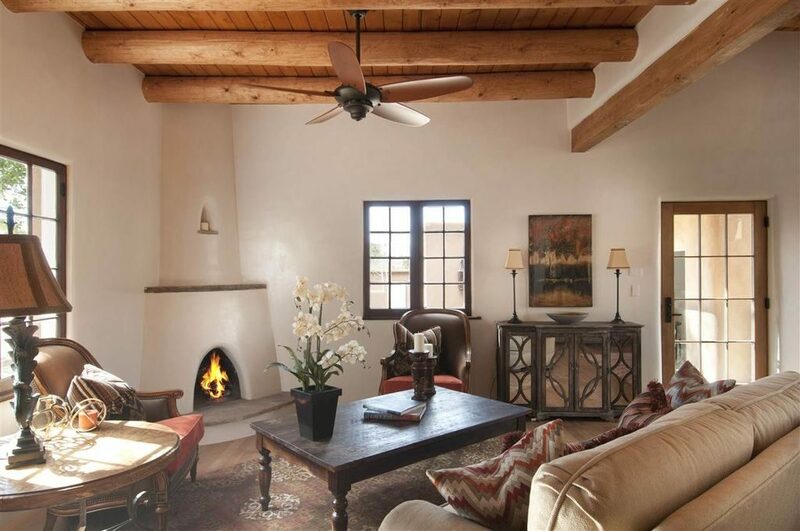 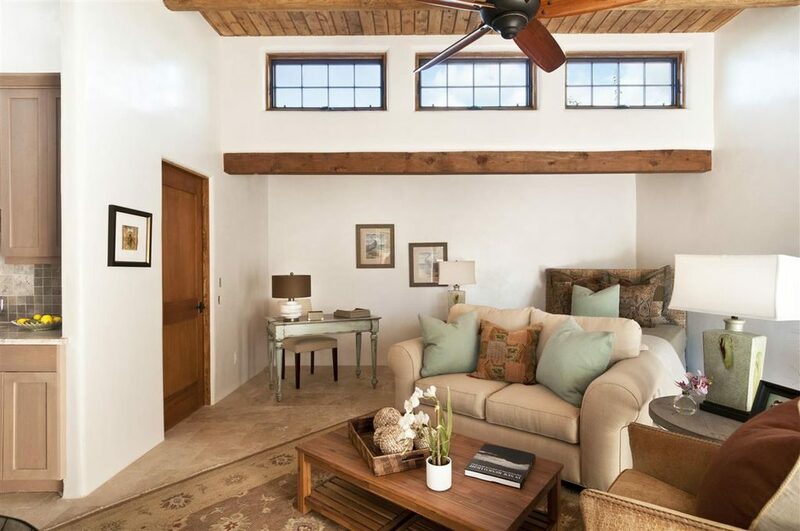 Vigas – peeled bark ceiling beams – give the ceilings wonderful character and drama. 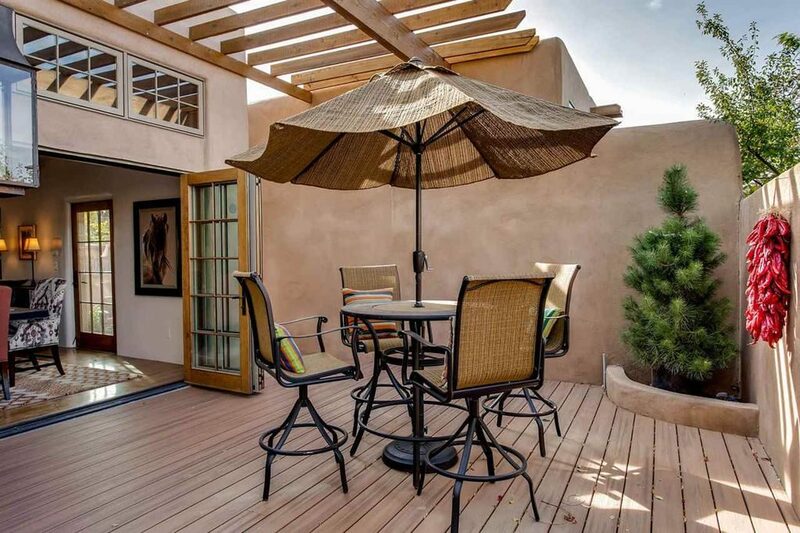 In this climate, you’re going to want to spend a lot of time outside…sign me up! 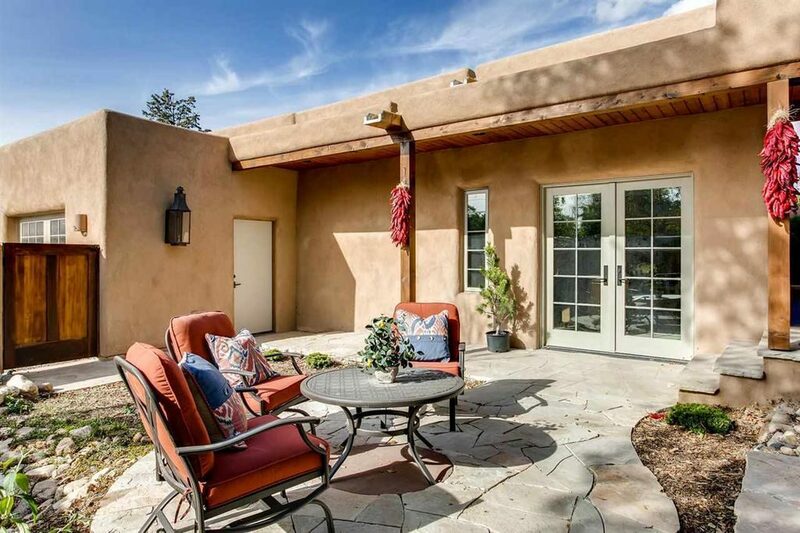 Back outside of this pueblo style home in Santa Fe – a quiet courtyard to relax in on cool desert nights.